Post operative atrial fibrillation (POAF) is more common than before due to increased numbers of cardiac surgeries. This in turn is associated with increased incidence of post operative complication, length of hospital stay and subsequent increase the cost of hospitalization. Therefore preventing and/or minimizing atrial fibrillation by pharmacological or nonpharmacological means is a reasonable goal. POAF has also been associated with postoperative delirium and neurocognitive decline. The precise pathophysiology of POAF is unknown, however most of the evidence suggests it is multifactorial. Different risk factors have been reported, and many studies have evaluated the prophylactic effects of different interventions. This review article highlights the incidence, risk factors, and pathogenesis, prevention, and treatment strategies of POAF. Postoperative atrial fibrillation has also been associated with postoperative delirium and neurocognitive decline. , The precise pathophysiology of POAF is unknown, however, most of the evidence suggests that it is multifactorial. Different risk factors have been reported, and many studies have evaluated the prophylactic effects of different interventions. This review article highlights the incidence, risk factors, pathogenesis, prevention, and treatment strategies of POAF. Do We Need to Treat POAF? Considering that POAF is associated with a higher incidence of heart failure, stroke, prolonged hospital stay, and increased costs, it is justifiable to treat it. In a retrospective study, the Texas Heart Institute of Cardiovascular Research database was used to identify patients who developed POAF. AF was diagnosed in 16% (n = 994) of the population (n = 6475) and was associated with greater in-hospital mortality, more strokes, and prolonged hospital stays. Several studies have evaluated the effectiveness of pharmacological and non-pharmacological interventions to prevent or decrease the high incidence of POAF. In 2006, the American College of Cardiology, the American Heart Association (AHA), and the European Society of Cardiology [Table 1]. , jointly published a guideline for the prevention and management of POAF. Beta-blockers have been the most studied drugs to date, for the prevention of POAF. These drugs are primary in AF prevention and should be used routinely in every patient. , Several clinical trials have evaluated the effect of various beta-blockers on the incidence of POAF, ,, and the results indicate an overall reduction of this complication. However, it should be noted that even in recent large trials where this strategy has been widely applied, the incidence of POAF remains nearly 60% in selected patients. This in turn supports the need for further preventive strategies in addition to beta-blockade. Sotalol is a beta-blocker that has important class III antiarrhythmic effects and has also been effective in the prevention of POAF, both when compared with placebo  and with other beta blockers, to elucidate the specific class III action. , However, the side effects of sotalol, such as hypotension and bradycardia, and in particular, its proarrhythmic effects, has limited its use in perioperative management. Using dual atrial pacing, such mechanisms minimize and / or prevent the development of intra- atrial entry, and hence, AF. Meta-analyses, ,, demonstrated a promising outcome on using single- or dual-site atrial pacing, which reduces the risk of new-onset POAF. However, the number of patients participating in these studies was small, and the protocol used for the pacing sites varied widely among these studies. Numerous studies have evaluated the nondihydropyridine calcium-channel blocker. The finding shows that calcium-channel blockers reduce the risk of supraventricular tachyarrhythmia. However, some studies that suggested using this drug preoperatively found an increased incidence of atrioventricular (AV) block and low-output syndrome, which was attributed to the negative inotropic and chronotropic effects of this medication. Therefore, the use of these agents should be considered with caution until more information on their safety profile become available. The prospective, randomized study, Atorvastatin for Reduction of MYocardial Dysrhythmia After cardiac surgery (ARMYDA-3)  demonstrated that treatment with atorvastatin (40 mg/day), started seven days before elective cardiac surgery under cardiopulmonary bypass and continued in the postoperative period, reduced the occurrence of POAF by 61%. A randomized trial by Calo et al,  showed that in 160 patients who underwent elective CABG, PUFA supplementation significantly lowered the incidence of POAF. The effect was similar to that seen when using beta-blockers, sotalol or amiodarone. Corticosteroids have anti-inflammatory properties; hence it has been studied for the treatment of POAF. Clinical trials in the past have shown significant reduction in the incidence of POAF in those patients who received steroid compared to controls. There is an increase in inflammatory mediators postoperatively, which predisposes the development of POAF in susceptible patients. A multicenter trial,  consisting of 241 consecutive patients undergoing cardiac surgery, was randomized to receive either 100 mg hydrocortisone or placebo. The incidence of POAF during the first 84 hours was significantly lower in the hydrocortisone group (36 of 120; 30%) than in the placebo group (58 of 121; 48%), and the adjusted Hazard Ratio (HR) was 0.54 (95% CI, 0.35 to 0.83; P = 0.004). A meta-analysis by Miller et al,  suggested that giving a magnesium supplement was effective for reducing POAF. Its efficacy in reducing AF was similar to that obtained from common antiarrhythmic drugs. However, the small numbers of patients used in these studies, and the design variability of the studies, limited the interpretation of these study results and their clinical application. N-acetylcysteine (NAC) is an antioxidant agent that minimizes cellular oxidative damage. , It has also been shown that NAC may reduce reperfusion arrhythmias, ischemia / reperfusion injury,  and / or extension of infarction. The use of NAC with reperfusion therapy in patients with acute myocardial infarction has also been associated with less oxidative stress and better preservation of left ventricular function. NAC has also shown beneficial effects in chronic pulmonary disease,  which is considered another risk factor for POAF. A study published in the European Heart Journal two years ago. suggested the potential benefits of using NAC perioperatively and its continued infusion for 48 hours postoperatively, to reduce the incidence of POAF. 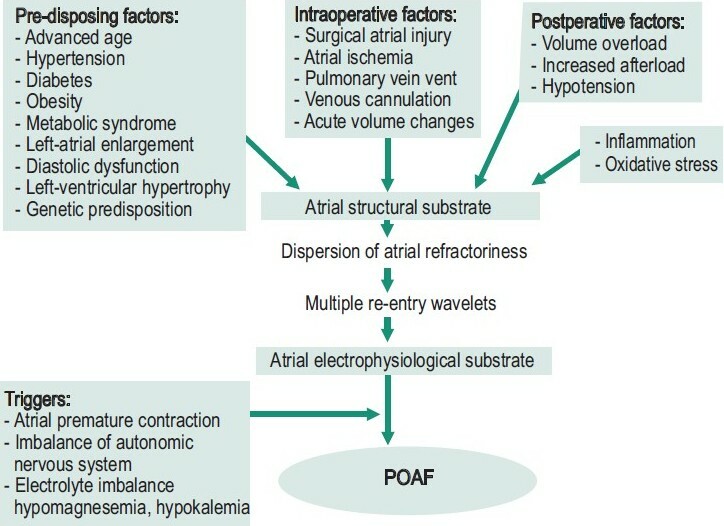 Although POAF is transient and self-limiting, treatment is indicated for patients who are hemodynamically unstable, and who develop cardiac ischemia or heart failure. The current treatment includes control of ventricular rate, and restoring / maintaining sinus rhythm in addition to prevention of thromboembolism. Most of the recent evidence suggests that rhythm control is better than rate control. The reason being that rhythm control maintains the patients in sinus rhythm, with decreasedlength of hospital stay. Different agents may beeffective in converting AF to sinus rhythm [Table 2], includingamiodarone,  procainamide,  ibutilide,  and sotalol. In one study,  ibutilide was more effective thanplacebo for the treatment of POAF, but polymorphicventricular tachycardia was reported, which was attributed to electrolyteimbalance. In the postoperative period, the beta blockingaction of sotalol was particularly effective inreducing the ventricular rate and its proarrhythmic toxicity was relatively infrequent, but this agent seemed less effective than the others for inducing cardioversion of AF. If POAF results in acute heart failure, myocardial ischemia or hemodynamic instability urgent electrical cardioversion should be performed. It should also be considered electively to restore sinus rhythm after the first onset of AF, if the pharmacologic trial has failed to resume a sinus rhythm. The postoperative recovery period is characterized by increased autonomic nervous system activity and adrenergic stress, and this in turn makes it difficult to control the ventricular rate in patients with POAF. Beta blockers are the therapy of choice, particularly in patients with ischemic heart disease; however, beta blockers are relatively contraindicated or poorly tolerated in patients known to have asthma or Bronchospasms, acute decompensated heart failure, or high-grade atrioventricular (AV) conduction block. Alternatively, other AV nodal blocking agents can be tried instead. Their dosages and side effects are presented in [Table 3]. Postoperative Atrial Fibrillation is the most common arrhythmia after cardiac surgery. The frequency of this arrhythmia is increasing, most likely due to the increasing number of elderly patients undergoing cardiac surgery. Currently, there are significant variations in the prevention strategies for POAF, with varied supportive evidence. The most recent evidence suggests that beta-blockers are effective, safe, and can be used in most patients. Therefore, unless contraindicated, beta-blockers should be continued perioperatively or initiated in all patients. In addition, amiodarone, statins, N-3 PUFAs, or NAC, may be used with beta-blocker as an adjunctive therapy. Such a combination therapy has been shown to be beneficial in reducing POAF. 1. Creswell LL, Schuessler RB, Rosenbloom M, Cox JL. Hazards of postoperative atrial arrhythmias. Ann Thorac Surg 1993;56:539-49. 2. Andrews TC, Reimold SC, Berlin JA, Antman EM. Prevention of supraventricular arrhythmias after coronary artery bypass surgery. A meta-analysis of randomized control trials. Circulation 1991;84:III236-44. 3. Mathew JP, Fontes ML, Tudor IC, Ramsay J, Duke P, Mazer CD, et al. A multicenter risk index for atrial fibrillation after cardiac surgery. JAMA 2004;291:1720-9. 4. Allessie MA, Boyden PA, Camm AJ, Klιber AG, Lab MJ, Legato MJ, et al. Pathophysiology and prevention of atrial fibrillation. Circulation 2001;103:769-77. 5. Maisel WH, Rawn J, Stevenson WG. Atrial fibrillation after cardiac surgery. Ann Intern Med 2001;135:1061-73. 6. Aranki SF, Shaw DP, Adams DH, Rizzo RJ, Couper GS, VanderVliet M, et al. Predictors of atrial fibrillation after coronary artery surgery. Current trends and impact on hospital resources. Circulation 1996;94:390-7. 7. Almassi GH, Schowalter T, Nicolosi AC, Aggarwal A, Moritz TE, Henderson WG, Tarazi R, et al. Atrial fibrillation after cardiac surgery: A major morbid event? Ann Surg 1997;226:501-11. 8. Mathew JP, Parks R, Savino JS, Friedman AS, Koch C, Mangano DT, et al. Atrial fibrillation following coronary artery bypass graft surgery: Predictors, outcomes, and resource utilization. MultiCenter Study of Perioperative Ischemia Research Group. JAMA 1996;276:300-6. 9. Banach M, Rysz J, Drozdz JA, Okonski P, Misztal M, Barylski M, et al. Risk factors of atrial fibrillation. following coronary artery bypass grafting: A preliminary report. Circ J 2006;70:438-41. 10. Fuster V, Rydιn LE, Asinger RW, Cannom DS, Crijns HJ, Frye RL, et al. ACC/AHA/ESC Guidelines for the Management of patients with atrial fibrillation: Executive summary. A Report of the American College of Cardiology/ American Heart Association Task Force on Practice Guidelines and the European Society of Cardiology Committee for Practice Guidelines and Policy Conferences (Committee to Develop Guidelines for the Management of Patients With Atrial Fibrillation): Developed in collaboration with the North American Society of Pacing and Electrophysiology. J Am Coll Cardiol 2001;38:1231-66. 11. Levy MN. Sympathetic-parasympathetic interactions in the heart. Circ Res 1971;29:437-45. 12. Ishii Y, Schuessler RB, Gaynor SL, Yamada K, Fu AS, Boineau JP, et al. Inflammation of atrium after cardiac surgery is associated with inhomogeneity of atrial conduction and atrial fibrillation. Circulation 2005;111:2881-8. 13. Tselentakis EV, Woodford E, Chandy J, Gaudette GR, Saltman AE. Inflammation effects on the electrical properties of atrial tissue and inducibility of postoperative atrial fibrillation. J Surg Res 2006;135:68-75. 14. Abdelhadi RH, Gurm HS, VanWagoner DR, Chung MK. Relation of an exaggerated rise in white blood cells after coronary bypass or cardiac valve surgery to development of atrial fibrillation postoperatively. Am J Cardiol 2004;93:1176-8. 15. Lamm G, Auer J, Weber T, Berent R, Ng C, Eber B. Post-operative white blood cell count predicts atrial fibrillation after cardiac surgery. J Cardiothorac Vasc Anesth 2006;20:51-6. 16. Spach MS, Dolber PC, Heidlage JF. Influence of the passive anisotropic properties on directional differences in propagation following modification of the sodium conductance in human atrial muscle. A model of reentry based on anisotropic discontinuous propagation. Circ Res 1988;62:811-32. 17. Wang TJ, Parise H, Levy D, D'Agostino RB Sr, Wolf PA, Vasan RS, et al. Obesity and the risk of new-onset atrial fibrillation. JAMA 2004;292:2471-7. 18. Echahidi N, Pibarot P, O'Hara G, Mathieu P. Mechanisms, prevention, and treatment of atrial fibrillation after cardiac surgery. J Am Coll Cardiol 2008;51:793-801. 19. Ad N, Snir E, Vidne BA, Golomb E. Potential preoperative markers for the risk of developing atrial fibrillation after cardiac surgery. Semin Thorac Cardiovasc Surg 1999;11:308-13. 20. Ak K, Akgun S, Tecimer T, Isbir CS, Civelek A, Tekeli A, et al. Determination of histopathologic risk factors for postoperative atrial fibrillation in cardiac surgery. Ann Thorac Surg 2005;79:1970-5. 21. Mariscalco G, Engstrφm KG, Ferrarese S, Cozzi G, Bruno VD, Sessa F, et al. Relationship between atrial histopathology and atrial fibrillation after coronary bypass surgery. J Thorac Cardiovasc Surg 2006;131:1364-72. 22. Bruins P, te Velthuis H, Yazdanbakhsh AP, Jansen PG, van Hardevelt FW, de Beaumont EM, et al. Activation of the complement system during and after cardiopulmonary bypass surgery: Postsurgery activation involves C-reactive protein and is associated with postoperative arrhythmia. Circulation 1997;96:3542-8. 23. Chung MK, Martin DO, Sprecher D, Wazni O, Kanderian A, Carnes CA, et al. C-reactive protein elevation in patients with atrial arrhythmias: Inflammatory mechanisms and persistence of atrial fibrillation. Circulation 2001;104:2886-91. 24. Aviles RJ, Martin DO, Apperson-Hansen C, Houghtaling PL, Rautaharju P, Kronmal RA, et al. Inflammation as a risk factor for atrial fibrillation. Circulation 2003;108:3006-10. 25. Stamou SC, Dangas G, Hill PC, Pfister AJ, Dullum MK, Boyce SW, et al. Atrial fibrillation after beating heart surgery. Am J Cardiol 2000;86:64-7. 26. American Heart Association. Heart Disease and Stroke Statistics-An Update 2007. Dallas, TX: American Heart Association; 2007. 27. uster V, Rydιn LE, Cannom DS, Crijns HJ, Curtis AB, Ellenbogen KA, et al. ACC/AHA/ESC 2006 guidelines for the management of patients with atrial fibrillation-executive summary: A report of the American College of Cardiology/American Heart Association Task Force on Practice Guidelines and the European Society of Cardiology Committee for Practice Guidelines (Writing Committee to Revise the 2001 Guidelines for the Management of Patients With Atrial Fibrillation). J Am CollCardiol 2006;48:854-906. 28. Lamb RK, Prabhakar G, Thorpe JA, Smith S, Norton R, Dyde JA. The use of atenolol in the prevention of supraventricular arrhythmias following coronary artery surgery. Eur Heart J 1988;9:32-6. 29. Matangi MF, Strickland J, Garbe GJ, Habib N, Basu AK, Burgess JJ, et al. Atenolol for the prevention of arrhythmias following coronary artery bypass grafting. Can J Cardiol 1989;5:229-34. 30. Connolly SJ, Cybulsky I, Lamy A, Roberts RS, O'brien B, Carroll S, et al. Double-blind, placebo controlled, randomized trial of prophylactic metoprolol for reduction of hospital length of stay after heart surgery: The beta-Blocker Length Of Stay (BLOS) study. AmHeart J 2003;145:226-32. 31. Coleman CI, Perkerson KA, Gillespie EL, Kluger J, Gallagher R, Horowitz S, et al. Impact of prophylactic postoperative beta-blockade on post-cardiothoracic surgery length of stay and atrial fibrillation. Ann Pharmacother 2004;38:2012-6. 32. Ferguson TB Jr, Coombs LP, Peterson ED. Preoperative betablocker use and mortality and morbidity following CABG surgery in North America. JAMA 2002;287:2221-7. 33. Pfisterer ME, Klφter-Weber UC, Huber M, Osswald S, Buser PT, Skarvan K, et al. Prevention of supraventricular tachyarrhythmias after open heart operation by low-dose sotalol: A prospective, double-blind, randomized, placebo-controlled study. Ann Thorac Surg 1997;64:1113-9. 34. Sanjuαn R, Blasco M, Carbonell N, Jordα A, Nϊρez J, Martνnez-Leσn J, et al. Preoperative use of sotalol vs atenolol for atrial fibrillation after cardiac surgery. Ann Thorac Surg 2004;77:838-43. 35. Parikka H, Toivonen L, Heikkila L, Virtanen K, Jarvinen A. Comparison of sotalol and metoprolol in the prevention of atrial fibrillation after coronary artery bypass surgery. J Cardiovasc Pharmacol 1998;31:67-73. 36. Mitchell LB, Exner DV, Wyse DG, Connolly CJ, Prystai GD, Bayes AJ, et al. Prophylactic oral amiodarone for the prevention of arrhythmias that begin early after revascularization, valve replacement, or repair (PAPABEAR): A randomized controlled trial. JAMA 2005;294:3093-100. 37. Bagshaw SM, Galbraith PD, Mitchell LB, Sauve R, Exner DV, Ghali WA. Prophylactic amiodarone for prevention of atrial fibrillation after cardiac surgery: A meta-analysis. Ann Thorac Surg 2006;82:1927-37. 38. Burgess DC, Kilborn MJ, Keech AC. Interventions for prevention of post-operative atrial fibrillation and its complications after cardiac surgery: A metaanalysis. Eur Heart J 2006;27:2846-57. 39. Crystal E, Connolly SJ, Sleik K, Ginger TJ, Yusuf S. Interventions on prevention of postoperative atrial fibrillation in patients undergoing heart surgery: A meta-analysis. Circulation 2002;106:75-80. 40. Daoud EG, Snow R, Hummel JD, Kalbfleisch SJ, Weiss R, Augostini R. Temporary atrialepicardial pacing as prophylaxis against atrial fibrillation after heart surgery: A meta-analysis. J Cardiovasc Electrophysiol 2003;14:127-32. 41. Marνn F, Pascual DA, Roldαn V, Arribas JM, Ahumada M, Tornel PL, et al. Statins and postoperative risk of atrial fibrillation following coronary artery bypass grafting. Am J Cardiol 2006;97:55-60. 42. Patti G, Chello M, Candura D, Pasceri V, D'Ambrosio A, Covino E, et al. Randomized trial of atorvastatin for reduction of post-operative atrial fibrillation in patients undergoing cardiac surgery: Results of the ARMYDA-3 (Atorvastatin for Reduction of Myocardial Dysrhythmia After cardiac surgery) study. Circulation 2006;114:1455-61. 43. Jahangiri A, Leifert WR, Patten GS, Mc Murchie EJ. Termination of asynchronous contractile activity in rat atrialmyocytes by N-3 polyunsaturated fatty acids. Mol Cell Biochem 2000;206:33-41. 44. Sarrazin JF, Comeau G, Daleau P, Kingma J, Plante I, Fournier D, et al. Reduced incidence of vagally-induced atrial fibrillation and expression levels of connexins by N-3 polyunsaturated fatty acids in dogs. J Am Coll Cardiol 2007;50:1505-12. 45. Mozaffarian D, Psaty BM, Rimm EB, Lemaitre RN, Burke GL, Lyles MF, et al. Fish intake and risk of incident atrial fibrillation. Circulation 2004;110:368-73. 46. Calς L, Bianconi L, Colivicchi F, Lamberti F, Loricchio ML, de Ruvo E et al. N-3 Fatty acids for the prevention of atrial fibrillation after coronary artery bypass surgery: A randomized, controlled trial. J Am Coll Cardiol 2005;45:1723-8. 47. Halonen J, Halonen P, Jδrvinen O, Taskinen P, Auvinen T, Tarkka M, et al. Corticosteroids for the prevention of atrial fibrillation after cardiac surgery: A randomized controlled trial. JAMA 2007;297:1562-7. 48. Miller S, Crystal E, Garfinkle M, Lau C, Lashevsky I, Connolly SJ. Effects of magnesium on atrial fibrillation after cardiac surgery: A meta-analysis. Heart 2005;91:618-23. 49. Arfsten D, Johnson E, Thitoff A, Jung A, Wilfong E, Lohrke S, et al. Impact of 30-day oral dosing with N-acetyl-L-cysteine on Sprague-Dawley rat physiology. Int J Toxicol 2004;23:239-47. 50. Ozaydin M, Peker O, Erdogan D, Kapan S, Turker Y, Varol E, et al. N-acetylcysteine for the prevention of postoperative atrial fibrillation: A prospective, randomized, placebo-controlled pilot study, Eur Heart J 2008;29:625-31. 51. Orhan G, Yapici N, Yuksel M, Sargin M, Senay S, Yalηin AS, et al. Effects of N-acetylcysteine on myocardial ischemia-reperfusion injury in bypass surgery. Heart Vessels 2006;21:42-7. 52. Sajkowska A, Wykretowicz A, Szczepanik A, Kempa M, Minczykowski A, Wysocki H. Fibrinolytic therapy and N-acetylocysteine in the treatment of patients with acute myocardial infarction: Its influence on authentic plasma hydroperoxide levels and polymorphonuclear neutrophil oxygen metabolism. Cardiology 1999;91:60-5. 53. Lee JK, Klein GJ, Krahn AD, Yee R, Zarnke K, Simpson C, et al. Rate-control versus conversion strategy in post-operative atrial fibrillation: Trial design and pilot study results. Card Electrophysiol Rev 2003;7:178-84. 54. Daoud EG, Strickberger SA, Man KC, Goyal R, Deeb GM, Bolling SF, et al. Preoperative amiodarone as prophylaxis against atrial fibrillation after heart surgery. N Engl J Med 1997;337:1785-91. 55. Kowey PR, Taylor JE, Rials SJ, Marinchak RA. Meta-analysis of the effectiveness of prophylactic drug therapy in preventing supraventricular arrhythmia early after coronary artery bypass grafting. Am J Cardiol 1992;69:963-5. 56. VanderLugt JT, Mattioni T, Denker S, Torchiana D, Ahern T, Wakefield LK, et al. Efficacy and safety of ibutilide fumarate for the conversion of atrial arrhythmias after cardiac surgery. Circulation 1999;100:369-75. 57. Gomes JA, Ip J, Santoni-Rugiu F, Mehta D, Ergin A, Lansman S, et al. Oral d, l sotalol reduces the incidence of post-operative atrial fibrillation in coronary artery bypass surgery patients: A randomized, double-blind, placebo-controlled study. J Am Coll Cardiol 1999;34:334-9. 58. Bucerius J, Gummert JF, Borger MA, Walther T, Doll N, Onnasch JF, et al. Stroke after cardiac surgery: A risk factor analysis of 16,184 consecutive adult patients. Ann Thorac Surg 2003;75:472-8. 59. Hogue CW Jr, Murphy SF, Schechtman KB, Davila-Roman VG. Risk factors for early or delayed stroke after cardiac surgery. Circulation 1999;100:642-7. 60. Meurin P, Weber H, Renaud N, Larrazet F, Tabet JY, Demolis P, et al. Evolution of the post-operative pericardial effusion after day 15. the problem of the late tamponade. Chest 2004;125:2182-7. 11 Does aortic valve disease etiology predict postoperative atrial fibrillation in patients undergoing aortic valve surgery?